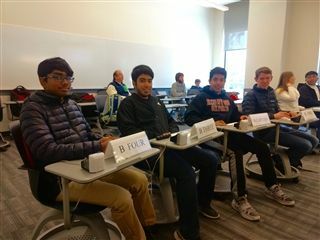 After contending with delays and missing teammates due to the snowstorm, four resolute KO students competed for the first time in the Northeast Regional High School Science Bowl held at the University of Connecticut in Storrs on March 3. Over 43 schools through the northeast were represented. Shrinaath Narasimhan ’22, Kush ’20 and Luv Kataria ’20 and John McLaughlin ’20 showed their scientific prowess on an array of topics from biology, physics, chemistry, and astronomy. And, for some extra mental exertion, there was some math involved, too. 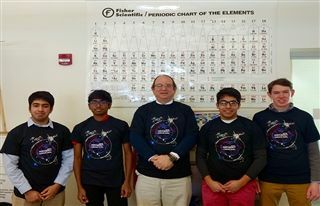 The club, initiated by Kush Katria who had a positive experience in his former middle school participating on his school’s team, formed the club with the encouragement from Science Department Chair Fritz Goodman and science teacher Noah Lynd. “I felt we could do more here at KO, and the teachers were really supportive. I think they really enjoyed it as well,” said Kataria. The club met for two times a week to prep for the event by practicing questions and solutions. The event was organized with a round robin of eight-minute halves comprised of 20 to 25 questions in which two teams competed against one another. Some questions were multiple choice and others were short answer. Contestants raced to answer quiz questions by pressing their buzzer button. Kush admitted, “You only have a couple of seconds to answer each question, and with the buzzing system, it’s hard to think straight in that situation.” In some cases, Kush solved the math problem with the correct answer but pushed the button a split second too late. Many of the participating KO students hadn’t taken a physics course yet so answering those questions proved challenging. As the group broadens its base of participants, the team will become even more competitive. Next year the group plans to strategize, and develop teams that play off the strength of the teammates' knowledge of a particular science. “Since this was our first time competing, I felt we did really well. I look forward to increasing the program in years to come,” said Kush.